Over 180 hectares of maize fields have been attacked by army worms in Chavuma district in North-Western Province. Chavuma District Commissioner Benjamin Mufunga confirmed the development to Zambia News and Information Services today. 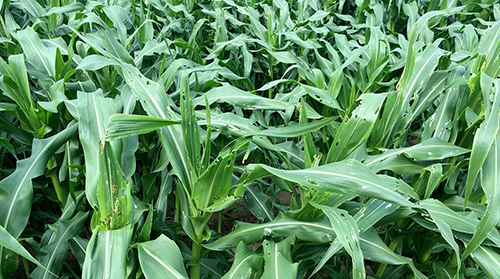 Mufunga said according to the infestation rate recorded by ministry of agriculture, about 732 households had their maize fields attacked by the notorious worms with an estimated crop damage of 30 percent. “Efforts are being made to ensure crops are not adversely damaged, farmers have been urged to purchase pest control chemicals while those who cannot afford are using cultural and indigenous methods to control the worms,” he said. He noted that the daily rains experienced recently had helped in reducing crop damage by the army worms in the district. In another development, the district commissioner has urged families under the Food Security Pack (FSP) to positively utilize the programme as it is meant to improve their livelihoods. And speaking earlier, assistant Community Development officer Paddy Kanyetta urged beneficiaries of the FSP to put the inputs to good use and attain food security at both household and national level.